In case of all these companies the principle is the same. 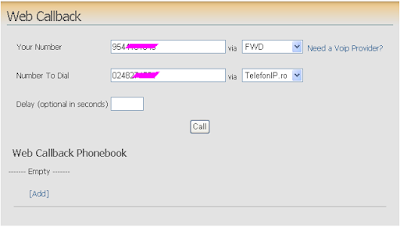 The caller enters his phone number and destination phone number in a form on a web page. Then the system is calling simultaneously both numbers and connects the calls. Because the VoIP calls don’t use parties’ bandwidth, this solution is preferred by dialup or mobile users and beginners (because you don’t need anything to install or configure). Since not one, but two calls are terminated to PSTN you’d expect that the cost of web activated telephony to be higher than the standard method of calling a PSTN number from a SIP device. Interesting enough the price is affordable in most situations. For advanced users, the guys at VoXaLot offer even a more powerful web activated telephony solution in which the caller has a better control over phone call cost. Let’s take a simple example. Let’s suppose that you are living in US and you want to call a friend in Romania using Web Activated Telephony and also you want to have a good control over your costs. To make a phone call, go to VoXaLot Web Callback page and enter your phone number and destination phone number. For each number specify the VoIP provider that should handle the connection. If you are connected via dialup you can specify a delay after which calls begins (in this time you’ll have to disconnect from Internet and release the phone line). When you talk using this method you’ll consume call-out minutes of both providers. Anyway, carefully choosing the 2 providers can translate to really cheap phone calls. You can even do cheap internationally phone calls from your mobile phone if you have a data plan. An alternative method (and better in my opinion) of doing cheap PSTN to PSTN phone calls via VoIP was described in the article: Mobile to VoIP bridge.